U.S. Announces 'Hack The Pentagon' Bug Bounty Program : The Two-Way The contest is only for "vetted hackers," the Department of Defense says, which means that anyone hoping to find vulnerabilities in its systems will first need to pass a background check. Secretary of Defense Ash Carter (left) says the Pentagon's new hacker program will strengthen America's digital defenses. 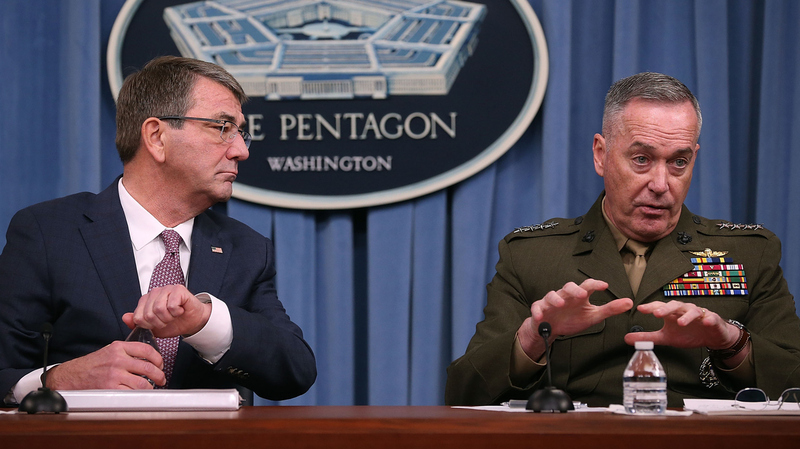 Carter is seen here with the chairman of the Joint Chiefs of Staff, Gen. Joseph Dunford. Announcing what it calls "the first cyber bug bounty program in the history of the federal government," the Department of Defense says it's inviting hackers to test the security of its Web pages and networks. The contest is only for "vetted hackers," the DoD says, which means that anyone hoping to find vulnerabilities in its systems will first need to pass a background check. Participants could win money and recognition for their work, the agency says. The pilot program is slated to begin in April. And if you're wondering whether the hackers might disrupt a critical piece of the Department of Defense's infrastructure, the agency says that hackers will target a predetermined system that's not part of its critical operations. According to a list published by the Defense Department, it currently manages 488 websites, which are devoted to everything from the 111th Attack Wing and other military units to the Yellow Ribbon Reintegration Program. The "Hack the Pentagon" initiative is the work of the Defense Digital Service, a DoD unit that was launched last fall as part of the White House's U.S. Digital Service. According to DDS Director Chris Lynch, "Bringing in the best talent, technology and processes from the private sector not only helps us deliver comprehensive, more secure solutions to the DoD, but it also helps us better protect our country." News of the bug bounty program, which is similar to security-boosting strategies used by private companies, follows word that the Defense Department "plans to hire private contractors to develop a $600 million-plus computer system for a new background check agency," as Reuters reports. Last summer, the Office of Personnel Management revealed that the private information of more than 20 million U.S. government workers and others had been stolen in a massive security breach. Nearly three years ago, the Pentagon publicly said China's government had conducted cyberattacks against the U.S. government, citing attacks on "numerous U.S. diplomatic, economic and defense industry networks," as the Two-Way reported.